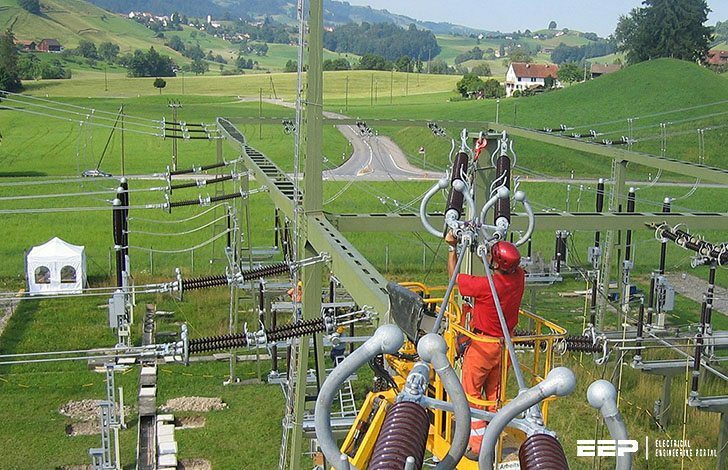 Following the publication of the standard IEC 61850 „Communication Networks and Systems in Substations“, the partial retrofit of the 380 kV substation Laufenburg in Switzerland has been one of the first projects worldwide based on it. Seven out of the 17 bays are being retrofitted until the end of 2006. A stepwise approach has minimized service interruption. 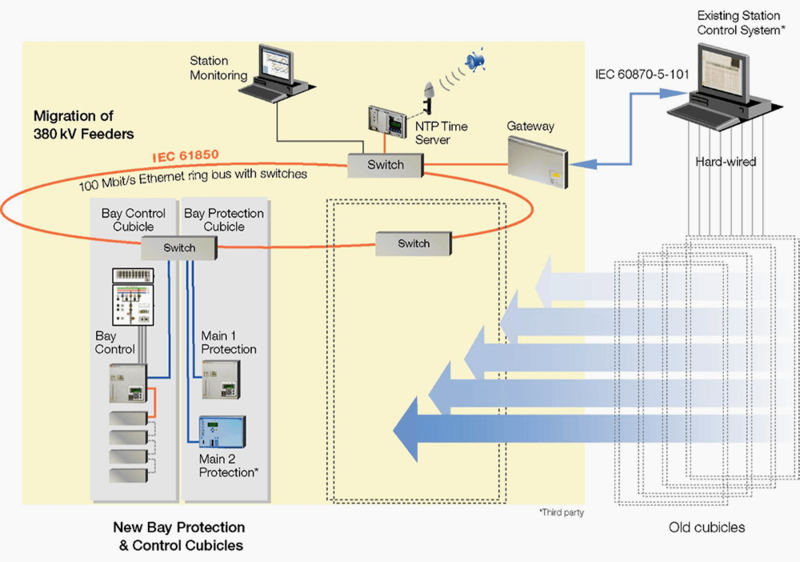 IEC 61850 was chosen to benefit from the future-proof features of this international standard. Existing and new 3rd party equipment was integrated with the substation automation system. Valuable experiences in using IEC 61850 were gained, both by the substation owner and the manufacturer. The first bay was put into service in December 2004, followed by another three bays during 2005. All project goals were reached. Project execution and operational experiences are related and an outlook on the future development of the standard is given. 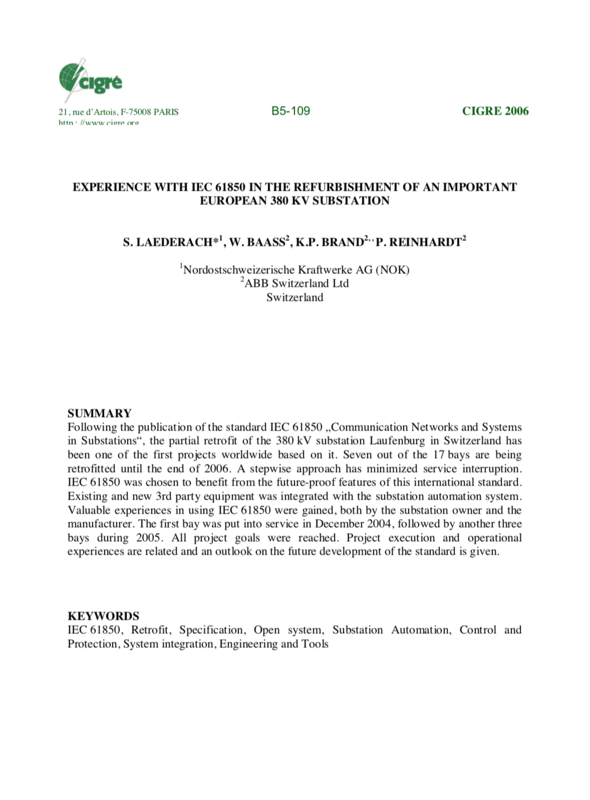 IEC 61850 was published as standard by IEC in fourteen parts between 2003 and 2005. It is the first and only global standard that considers all the communication needs within a substation and has been discussed in various papers and articles. The standard defines strict rules for realizing interoperability between functions and devices used for protection, monitoring, control and automation in substations independent of the manufacturer. Interoperability means the capability of two or more intelligent electronic devices (IEDs) from one or several vendors to exchange information and to use it in performing their functions and for correct co-operation. It also covers design aspects, protocol requirements, testing guidelines, etc. To exploit the full benefits of IEC 61850, its application requires careful consideration of the customer requirements as well as of the available equipment. This especially applies to substation refurbishments. First substation automation (SA) systems with IEC 61850 were put into service end of 2004. One of the first experiences and the very first on high voltage level worldwide was made with the Swiss 380 kV Laufenburg station. This is a very significant grid node in the European interconnected system. Its configuration is a triple busbar system with transfer bus and several longitudinal sections. After almost forty years in operation, the primary and secondary equipment of seven out of 17 feeders needed to be replaced in several steps over a two-year period.